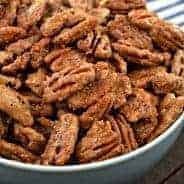 I love a good snack mix. Don’t you ever get sick of buying chips and crackers? I must spend a fortune on cheese crackers. And with school out this week, my kids tend to eat us out of house and home. But this snack mix? You can buy the expensive cheese crackers and mix them with pretzels, oyster crackers and chex cereal (I used an off brand to make it even less expensive). Top them with the seasoning and let them hang out in a paper bag (NO OVEN NEEDED) for a few hours. These are way better than any flavored cheese crackers you might buy from the grocery store. Plus, you can make your own taco seasoning (this one is pretty yummy). Thank you to Allison at Alli -n- Sons for inspiring me to make my own taco seasoned mix. 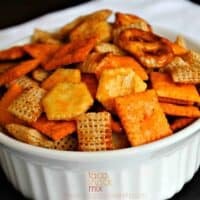 Want more snack mix recipes? 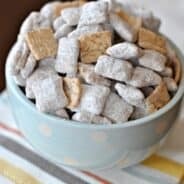 White Trash Candy Mix – cause you need a sweet version too! Ooh, yum. I saw this at Alli-n-son and now I really want it! Must be snack mix day! I just posted one too…but mine is sweet. I have never bought taco seasoning, it’s so easy to make! 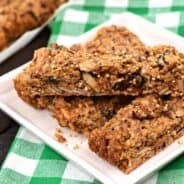 This looks like a great snack to keep on hand. I bet the kids wolf it down! I love to make my own snack and trail mixes!!! For the price of buying and making your own, you get so much more!!! I know my kids would eat this up in a heartbeat!!! I love taco seasoning and I love cheese its, I could eat the entire bowl! This is a fun mix! My kids would go crazy for this! When they have friends over, I’m always looking for inexpensive snacks to feed a crowd. These mixes are great – perfect for summer road trips! I did taco pretzels recently and everyone loved them! What a cool idea! Easy AND delicious. Can’t beat that! Thanks for the recipe!! Sounds yummy. I never would’ve thought to try something like that. Great snack idea! Perfect for road trips or vacation treats! I’d love to invite you to join us and share Saturday Show & Tell on Cheerios and Lattes! I know my readers will love your ideas too! Yum!! You don’t need to bake it? Nope, no baking. Just stick it in a paper bag to dry out. Mmmmm…. Yum! I so have to try this! This does look yummy, but I think I would prefer it baked because it toasts the crackers and cereal and the flavor bakes in. 3/4 cup taco seasoning? Sounds like way too much. I could maybe see 3-4 Tbsp.